Chuck provides comprehensive tree, shrub, lawn, tick and deer services in and around Weston, Bedford and Carlisle, MA. He is a seasoned professional with years of experience providing some of our most popular services including tree removal, tree pruning, tree and lawn fertilization and disease treatments, shrub services, lawn aeration, lawn seeding, organic lawn care, pest control including tick and mosquito treatments and deer repellents. If you would like Chuck to come out to your property to assess its health and setup a comprehensive and custom plan to keep your trees and lawn healthy, beautiful and safe, don’t hesitate to reach out to him today! 22 years in the green industry. Plant health care, ornamental and shade tree pruning. Recently worked with an orchard owner to get more skills and knowledge in maintaining an orchard. Chuck earned his B.A. in Environmental Studies from Johnson State College. Certificate from UMAss extension for control of invasive plants. Chuck lives in Milford, enjoys spending time with family, hiking and water sports. With his family, he does service projects with their church, and relaxes by playing board games. October 31, 2018 – I was called in to look at an Ash tree in Canton, MA today. 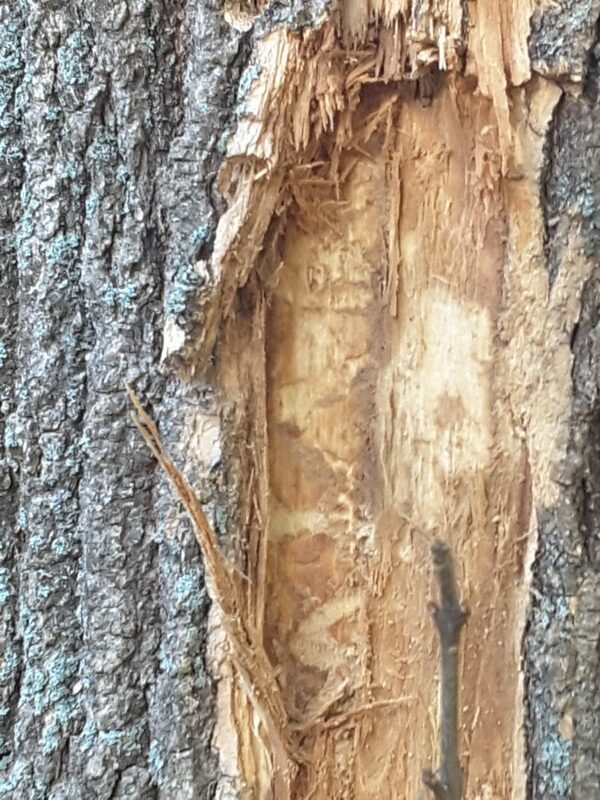 The photos show confirmation of Emerald Ash Borer. This location is close to the Blue Hills Reservation and other confirmed sightings of the Emerald Ash Borer. October 15, 2018 – I stopped in at a property today and I was able to enjoy the Seven Sons flower of these two plants. It was a great day for fall color with winter interest showing with the shedding bark. October 10, 2018 – While walking a property yesterday, we discovered mushrooms growing out of the ground. At first they were hard to identify, but then we spotted them and enjoyed their look among the ground cover. October 5, 2018 – Working in Needham, MA today. I got to see fall color on a Sugar Maple. That reminds me of the beauty I get to enjoy every season of the year!